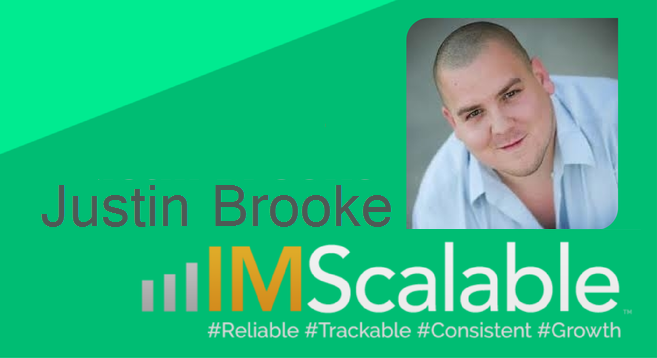 Justin Brooke is the Founder and CEO of IMScalable, an agency that specializes in paid traffic. Justin has generated billions of ad impressions, sold millions of dollars worth of products, and been hired by dozens of well known companies. His client list includes Snuggie, Trump University, Russell Brunson, just to name a few. In 2007 he was nominated for best marketer of the year by the American Business Awards, as well as, top 25 entrepreneurs under 25 by Business Week magazine. Paul: On today's show I'm going to introduce you to Justin Brooke, who's kind of a paid traffic expert. And he has a company called IMScalable, which is an agency which specializes in paid traffic management. Although a lot of his experiences stemmed from info products, supplements, and also some things like that -- his knowledge is really, really valuable to anyone who's looking to scale a software business. And he shares some great insights. So let's get him on and explore some of these strategies that Justin's going to share with us today. Hi, Justin, welcome to the show. Justin: Hey, man, thanks for having me. Paul: Thanks for taking the time out. Justin, you know you're… we've met a few times before, and I've known about you for a long time, very much as a paid traffic ninja. And I really wanted to get you on the show. You've got a really cool paid traffic business called IMScalable. And I know you do some great work with clients in terms of managing their campaigns and literally turning one dollar into two or three. And I thought it would fantastic if we could get you on and sort of share some strategies and tips to my tribe who are also building software companies on how to build traffic funnels using paid traffic, and what sort of traffic sources they should look at, what's easiest to test, et cetera. So, I really appreciate that. How's that sound? Justin: That sounds good, man, and thanks for having me on. Paul: Brilliant. How long's your business been going now? Justin: Well, we've only been doing the agency thing for the last two years, but I've been in business, or at least trying to make money online, since 2005. 2007 was when we had our first big success. We used to teach people how to buy and sell websites for profit. And then in doing that, we learned that traffic was the thing. You know, everybody always asked us, "How do you keep getting so much traffic to these websites?" Because that's how I was able to sell the websites for more than other people were able to sell them. I was able to get a lot of traffic to the websites. Justin: So we kind of noticed that that was the big hot button for everyone. And tried teaching it for a little while, and we still do attempt to teach it. But we've really realized that people really just want traffic done for them. They just want someone to make the traffic happen, make the ROI happen. And slowly but surely an agency was born. Paul: Got it. And so your agency – what's it do? So, if I'm a customer, I come to you and say, "Hey, Justin, I want traffic." How do you approach that problem? Do you have like a formula to go through to actually you know work out what's the best sources? Justin: Ok so, I mean, the best way to get started really is…. I'm sure in the software world everyone is familiar with the lean model, lean startup model of starting with a minimum viable product. And maybe sometimes even starting with less than that, just a survey. Well the same thing goes with traffic. See, most people what they do is they go out there and they build a whole funnel. And then they go out and try and get traffic. And then the traffic doesn't work because they've already built the funnel before they've gone out and gotten the traffic. They never asked the traffic what the traffic wanted. And so then the funnel doesn't work. And they always blame the traffic. "Oh, Facebook doesn't work. Google doesn't work." Or whatever doesn't work for them, when in reality it's the funnel that does the conversions. It's your landing pages that does the conversions. It's not the traffic that does the actual conversions. Obviously you could go on Google and type in "cheap traffic," and you can buy 10,000 clicks for $19.99. Well that traffic's probably not going to convert. But if you're using any of the mainstream ad networks, then that traffic works. If millions of people, millions of businesses are using it, and there's case studies of success, the traffic works. It's your funnel that doesn't work. So I highly recommend people start out with just an article, and then in the article have a click through link to a landing page. Start out with seeing, can you get people to go to your article, and then can you get them to click through on that article? If you can't do that, there's no sense in building a whole entire funnel. Justin: You're not going to be able to get them to go through the whole funnel. And so, that's what I really recommend people start out doing is, they really need to think about the traffic they're going to be driving in that funnel-building stage. And start out with a really simple landing page, it could be an opt-in page. It doesn't have to be just an article. But just start out with a really simple, minimal viable funnel. This is something that Todd Brown's been talking a lot about lately. And I love the idea. I love the concept because it's so true. Start with something super simple, see if you can get that to work and then build on it. So, just to kind of wrap things up, if I were to start with just an opt-in page, I would first see, ok can I get traffic to the opt-in page? Yes, I get traffic to there. Ok, but my opt-in rate is only 10 percent. Well, I need to fix the page, and I get my opt-in rate to 30 percent. Ok, well now I need to monetize these leads that are coming through here, so I'm going to put an upsell right behind the squeeze page. And maybe I start making some money there, but it's not enough money to get a positive ROI off of my traffic. So I may add another upsell, or maybe there's a downseller. So, you end up building the funnel along the way, and that's how you really get a paid traffic funnel that turns the traffic into positive ROI, if that's makes sense. Paul: It makes perfect sense. And, do you think – so, let's say, your software product is obviously where you want your customers to end up. But, I've been reading a lot that's it's good to put a low ticket offer right after the opt-in, to try and get them to buy something straightaway. Which does two things – one, it qualifies your traffic into buyers. You can sort of split them off into buyers and non-buyers. And two, obviously that initial low ticket sale can actually pay for your traffic before those customers actually get to your main product, your core product. Does that make sense? Justin: Absolutely. Yeah, yeah, that's… The difference in – there's a whole world of selling high ticket products and coaching and services and stuff like that. And there's a way of doing that where you do lead gen, and then you warm those people up. Paid traffic – you either do lead gen, and then you build a relationship, and you get them on the phone, or you use some sort of more intimate relationship. But if you're just going to turn paid traffic into a product sale, you really need to kind of walk the customer through a series of steps. So take them to an article first, and then they click through the article to get this free thing, that you mentioned in the article which now they're going through an opt-in page. And then maybe you have a premium version of that opt-in page. You know if you had a report, well, maybe you have a four-part video series that goes with the report that teaches them the concept a little bit better. And then behind that you have a software that does that concept for them. And so, you're taking them through this whole little process, and along the way they're just taking small, little steps instead of trying to go from, "Hey, you're a perfect stranger. You should buy my product." Paul: Yeah. I know, I see that. So, and obviously by doing that step by step, and educating the customer all the way that's what makes the whole thing scalable, right? Because once you get that working, it's just a question of how much traffic can I buy for it? Justin: Absolutely. You know, the name of the game is keeping your cost per click lower than your earnings per click. And if people only tracked one thing, that would be the one thing. And I swear, if people just tracked that, they would be doing better than 95 percent of people out there. Because 95 percent of people out there, the only way they're tracking is, literally, "Do I have more money in my pocket today than I did yesterday? Ok, things are working." And that's just a nonsense way of tracking, but if you at least looked at, "Ok, I am – over a 30 day period, I am earning, on average $2.72 per click. Therefore, I can afford to spend up to $1.50 per click when I factor in all my expenses and whatnot." And if people would just do that level of tracking, when they get their earnings per click over their cost per click, they can buy as much traffic as they can possibly handle. But they should track the differences – you know, if you track your earnings per click from Facebook, different from your Google AdWords traffic and your social traffic. Because they will be different, and you need to know what the cost and earnings are for each channel. Paul: So, two things I want to just drill down on, which you mentioned. The first one is, you said try and get some traffic to an article first, before almost the opt-in. So, you're almost like pre-selling, or warming up your traffic before the opt-in. Whereas a lot of people just buy traffic and send it direct to an opt-in. Do you think that's a much more effective way? It's almost like a crossover between content marketing and paid traffic, isn't it? Justin: It is. It's what I do with all of my own traffic. It's not something I'm able to talk a lot of my customers into because they've been doing the old way of traffic forever, and they have established funnels that are able to handle it so they don't need to go to content first. I prefer to go to content because it's easier for me to whip up a new blog post or a new article than it is to create a new landing page. But I can create a bunch of different articles, which gives me lots of new fresh ads to serve to my audience – especially on Facebook where the life cycle of an ad is very, very short – sometimes as little as three days before an ad just starts fatiguing and doesn't work as well anymore. So creating the content in front of the landing page gives me all this fresh new stuff. The biggest thing that it does is it's like a Trojan horse. The person doesn't know that you're trying to sell them to something, and then they feel like they're discovering. They've read this article, and they found this, "Wow, there was this awesome spreadsheet that I got. All I had to do was give this guy my email address, now I have this amazing free tool that I can use." They feel like they discovered it instead of feeling like they were – you know a carrot was dangled in front of their face. It just changes the mindset. Paul: Yeah, absolutely. Because people hate being sold to, right? But they love buying. Paul: So, but they love being educated as well. So if they get something – so basically, you're creating a blog post, and you're pushing that to, for example, Facebook, sending paid traffic to Facebook to that article. Then obviously there's a call to action in that article for, as you said like, the free Excel sheet or something like that. And that's behind the opt-in. And then from the opt-in then you try to send them to like a $7 type product, which could be, say, a video walk-through of the method, whatever it is. Justin: Yeah. So, one example of this is I have this spreadsheet that I give out that's 202 traffic resources, and people love that. Everybody from newbies to veterans, they want this spreadsheet of 202 different traffic resources. Well, then, the follow-up email that I've done previously – it's not my current one, but the follow-up email was, you know, "This spreadsheet is great. And I'm so glad that you got it, and I'm sure you love it. There's just one problem. You know, all those resources are kind of worthless unless you know really how to use those, and how to create the right landing pages for each of those traffic sources." And I give them an example of you know like, "This is the type of landing page that works for Google AdWords, but that wouldn't work well for pop up traffic. And that wouldn't work well for this type of traffic. So, if you want, for $7 you can get access to my four part video series, that teaches you which types of landing pages work with which types of traffic." And that connects the free thing that they just got, adds more value, gets them to become a customer. And this is a funnel that I used to have, and then I eventually sold them coaching at the end. You know, "I will walk you through this whole thing." But, yeah, that just explains how you would be able to take them through this whole process. Paul: Excellent. And do you use retargeting as well at that stage, you know to try and get them opted in? Justin: Yes. A lot of people are scared to pay money to advertise a blog post. Because one, it's new, it's not something people have done, have heard about other people doing. You're worried that you're not going to convert that person. But you can design your blog to have your offer in the header, in the sidebar, and then in the footer. And then inside the article you have a couple of links. So it's very easy to get them to go from the ad to go where you want them to, which is to become a subscriber, to become a lead. And then, you can also drop a retargeting pixel on each of those blog posts. So, no matter what, you're still going to be following them around, and they've already come into your environment. They're caught, in essence. You know, they're a fish who's already on the boat. Paul: And so, that sounds perfect to me. And you've explained a couple things about getting the ROI on traffic quite early on in the process. The other thing that I always struggle with – you know, a lot of people I talk to struggle with – is the best way to track this stuff. Because when you've got lots of different traffic sources, and you've got lots of different ways of people coming in to your funnel – even on my blog, for example, I've got opt-in forms all over the place, right? Tracking where everyone's coming from, and at what stage they're converting to what, that is really difficult, I find. And I'm wondering, how do you approach that? Do you use one sort of all-in tool, or is it really using a collection of tools and doing a lot of spreadsheet work at the end of it? Justin: Well, this is one of the reasons why I use HubSpot, is because HubSpot is very good at just doing the tracking for me, I don't have to think very hard about setting up lots of traffic. Like, sometimes I will forget to use a tracking link, but I know that HubSpot will catch me if I fall because HubSpot is pretty good at knowing where that traffic came from and then following them through the various… you know, they came to my blog, and then they went to this landing page. They then interacted with me on this tweet. They follow that person around. If you're not going to use HubSpot, the next best solution for you is to use a couple of layers. And this is the recipe that I recommend people use. You want to have an analytics tool, and then you want to have a tracking tool. And the difference in my mind – technically, Google Analytics could do both, but here's why I don't use them for both. Google Analytics is really good at the analytics side of web tracking, web analytics. They're really good at telling you, "Ok, here's how much traffic you've had, and they've stayed on your site for this long. And they visited these many pages." For getting that in depth, what are they doing on my site. But Google Analytics isn't great at telling you, "Ok so you spent $30 on this ad, you got 400 clicks, and 12 of them bought. And you have an EPC of $2.40, or whatever." You can make it do that if you're really good at programming, and you really understand how to use goals and event tracking, the possibility is there. But it's hard. There's other tools that are just like – you know that stuff is built in. I built one of my own tools called PixelTrack.com. I'm no longer the owner. I sold the software. I just… I tried to get into the SaaS business, and I just don't have the resources. Passed it on to somebody else, who's carrying the torch. And it's specifically designed to give you one link that you use for every ad or every email or for a banner on your sidebar, and then you will know that that specific ad, or that banner on your sidebar or that email that you sent out got you X amount of clicks with X amount of conversions, turned into X amount of dollars and measures the economics of the traffic instead of what the traffic is doing, and how long they stayed, and if your site is working, is functioning well. So, using those two different layers. And another tool, not to just be biased on something I've made, but Improvely is another tool that I use and love and recommend all the time. So, using those two different layers that will give you the ability to use a tracking link, which is something everybody should use whenever they're linking to something that has a financial or a conversion metric that they're going to be looking to follow up with. And then I have Google Analytics as the catch all telling me how that traffic is performing on my website. Paul: Right, right. I got it. And Improvely, is that like – so that's actually a tracking system, is it? Justin: Yes, it's a tracking software, and it actually will let you do split testing as well – basic split testing, like if you wanted to test two different links, you could maybe have two different blog posts that you want to sent the traffic to. Well, they will give you one tracking link that rotates the traffic to those two different blog posts. That way you can tell which one got you more opt-ins, or whatever. Paul: Right, I understand. But at the moment what you're focusing on is HubSpot, with your business and with your clients' business, yeah? Justin: With my own business. With my clients I usually use Improvely as a tracking source, or they come to me with their own tracking tools that they already have. Most of the guys that I work with are established companies. They already have… I'm one media buyer among many on their team, and we're just helping them buy as much traffic as they can get. So if they don't have a tracking tool, then we use Improvely. But for myself, I use HubSpot because it just does all of that combined for me. I just create a tracking link, and it does all of it for me. Paul: Right, got it. That's cool. So, just moving on a bit, so now someone knows how to test a funnel, they know how to produce some content and send traffic to that, what kind of traffic sources should people start with? And what do you think they should do to scale it? You know, to start testing something quite quickly? You know, a lot of people say Facebook. I don't know. Facebook's quite easy for me to get started to see whether something's working, but I'm interested to see whether that mirrors your thoughts, too. Justin: So, there's two different schools of thought. There's one school of thought that you use the cheapest possible traffic that you could buy. You know, it may not be good, quality traffic, but it's super, super cheap, which will allow you to get a lot of traffic and do a lot of testing for very little money. And then you know that if you can make it work and this is what I did when I was working for Rich Shefren as his media buyer when we were testing a new funnel, you know one of the things he said, "You know, I want to test this cheap," so I went to pop-up ads. And that traffic – I can get 4,000 visitors for, like, $40, maybe even less than that. So, I can get a massive amount of traffic very quickly, very cheaply, and then that allows me to do lots of split testing to make sure my pages are working very well. And I know that if I can make something work on that traffic, when I take it to Facebook, or when I take it to Google or whatever, it's going to work incredibly well because now I'm dealing with high quality traffic. Or, the other school of thought is you start with the really high quality traffic first, and then, once you have that working, then you kind of work your way down into getting more and more traffic by adding on less quality sources. But sometimes the less quality sources have so much more volume that it helps you. So I would say a good middle ground in between there is Facebook ads, but Facebook ads is super competitive right now, making lots of changes, shutting down lots of accounts, which is really going through a maturing phase. I would tell people to look at Twitter ads right now. It's working really well for me. They have a very competitive platform to Facebook. Still very easy to use. You could target all of your competitors' Twitter followers – it's a really, really good platform. And they even have the same custom audiences function. They just call it tailored audiences. So you could upload your email list to Twitter, and serve ads to them on Twitter. Paul: Wow, that's cool. And that traffic you find converts in a similar sort of way as something like Facebook? Justin: Oh, absolutely, yeah. Just yesterday I was doing my coaching call, and the topic of the day, I was walking people through, showing them how to set up a Twitter ad campaign. And just as an example, I pulled out one of my affiliate links, and I had to create a tweet in order to finish creating the campaign. Literally within 15 minutes of creating that campaign, someone had tweeted me saying that they just bought that product from me. And I took a screen shot and I posted on my fan page saying, "You see, it works. It works!" It does, it really does. It works just that fast. Paul: That's really cool. Because what I find with Twitter, you're either in or you're out. Because there's a lot of people who say, "Oh, Twitter doesn't really generate good traffic." And I find, especially in the software world, a lot of the startup space and a lot of the serious players in software are all on Twitter. I mean that's where they live. You're less likely to find them in Facebook. So, I guess to a certain extent, depending on the type demographic you're trying to attract – you know, it could be like a lot more powerful than Facebook because there's a lot more professionals. Justin: Yeah, and I would say that if somebody is in the gamer market or the fitness market, maybe YouTube is probably a better spot for them. You've got to think about who is your market, and where do they hang out the most? Some people, it would be impossible to reach on Facebook or on Twitter. Like if I was looking for someone who was… who needed a dentist in West Palm Beach, I need to use Google AdWords for that. It's going to be really hard to use Facebook to find someone who's looking for a dentist in West Palm Beach this week. Justin: I wouldn't know how to do that on Facebook or Twitter. If I wanted to find someone who's looking for game play footage on the latest XBox game, I'm going to use YouTube. If I'm looking for startup guys, or if I've got a celebrity gossip blog, then I'm going to use Twitter. Just think about who your market is, and where do they frequent and then buy ads there. The traffic is already there. There's bajillions of clicks and visitors happening all over the web. You don't have to create traffic – it's already out there somewhere. You just have to figure out where that is, create an ad – and I kind of think of it as poking the little hole – then that traffic starts leaking over to your website, right? Paul: Right, yeah, yeah. And I think for me, it's just having a big picture view. Being able to see traffic coming in, how much it's costing you, and as you said, what the EPC is for that traffic from an ultimate dashboard perspective. You know, and being able to see that and understand it so that you can actually make decisions on it. That I find one of the toughest things to do. Justin: Yeah, and the other thing I would tell people is, the greatest advertisers in the world don't have home run campaigns every time they create a campaign within the first 30 days. And that's what I see everybody trying to do, "I'm going to start a Facebook campaign or Twitter or AdWords" – or whatever. And they're hoping that the first ads they create are going to be profitable. I have seen it happen. I have a couple of cases where that has happened. But 95% – maybe even 99% – of the time, I create an ad, and it's not profitable at the start. There are some sales, not enough sales to make it profitable. So, what you do is you find out which of the keywords are not turning into sales, and you remove those keywords. Or you find out which of the ads have a really low click-through rate, and you remove those ads. And so it's a process of getting it dialed in. You make the traffic profitable. You don't buy profitable traffic – I wish that was the case. That would be amazing if we could just go to the profitable traffic store and just buy always profitable traffic. Instead, what you do is you buy traffic, and then you make it profitable through your marketing and conversion optimization. Paul: Right. And I guess the trick is not to blow your budget, or at least to understand or set an expectation of what your budget is for testing. Because, I think, with that in mind it's going to take at least 30 days to try and get a campaign profitable. Then you've got to have at least 30 days' worth of budget to play with. Justin: Yes, absolutely. And you should be prepared that in that 30 days that it's not going to be profitable. And instead what you want to do in that first 30 days is learn as much as possible, so test multiple landing pages, test multiple ads. Test different market segments, different images in your ads. You test all this stuff, that way at the end of the 30 days, you're able to see, "Ok, well, this 75% of the things that I tried didn't work, but this 25% of the stuff that I tried worked very well." Now you remove the 75% and you put all the budget on just the 25% that was working, and now you have a profitable campaign. Paul: Got it, got it. That's really good. You know, and I think, so it's getting all that data together, understanding it – have you got a bit of a maths brain? Have you always been this way? Justin: No, actually, it took me four years to get through algebra. Yeah really, I deal with numbers everyday now, and I kind of laugh at how much of a hard time I gave all my math teachers in high school, and now that's all I do is math all day long. Paul: Yeah, yeah. I know, I know. I'm doing it with spreadsheets, and I still find it a bit tricky sometimes. Brilliant. Listen, Justin, we're coming to the end of the show, and I really appreciate you coming on. Tell me a bit about… so, you're looking for businesses that have a funnel. But would you also take on software businesses that have a product that they know converts, and now they're looking to scale up? Justin: Yeah, well, we have two different types of customers. When we're doing ads for people, we don't want to take people's money and then them not get an ROI. So, we don't work with any customers… we'll know within 10 minutes of looking at somebody's funnel and landing pages, talking with them, whether or not we're going to be able to get a positive ROI for them. If we don't think we can get a positive ROI for them, we're not even going to work with them. We're just going to tell them, "No." And instead if they need help on their funnel, or if they need to get to a place where they can start getting an ROI on ads, instead we refer them over to our coaching program where we can help them start their own campaigns and then watch over them with screen shares and tell them, "Ok, click here, click there. Here's how you increase the profits on your campaigns. Here's how you reduce the waste." And so there's two different types. The customer who already has an established funnel, we handle their ads for them. We just do the traffic for them. For somebody who's not there yet, we teach them how to get there. Paul: Brilliant. And, again, from the software business perspective, you know everyone's trying to get people on as a free trial or something like that. But what we're learning, and what I know from the content marketing business, is that the concept really is to get people to content first, get them educated – get them educated before the opt-in. Then they feel good about opting in. They feel good, then, about getting the reward or the prize – whatever the offer is after the opt-in – or the lead magnet, as we call it. And then they feel even better then of upgrading or buying some sort of upsell, which then helps you pay for the traffic. So, that's the strategy to follow, right, even for the software business? Justin: Yeah, I mean, the free trial model has been working successfully in membership sites and the adult entertainment industry for years and years. The free trial model absolutely works. It's just a matter of your follow up systems and your marketing, your landing pages. You know, after the free trial, are you able to convert them into a paid, active user? And if you can do that, do you have a good retention strategy? So if you have those things in place, yeah, just use these traffic systems, get as many people into your free trial as possible. And use your follow ups and your retention strategies to turn those visitors into profitable customers. Paul: Justin, thanks ever so much for your insights there. And, you know I think that's great – I think for anyone listening now you probably got some structure into what a funnel should look like, what a paid traffic funnel should look like. And, obviously, if you're ready to scale, or you want to take your business to the next level, then look up Justin at IMScalable.com. Good stuff Justin. I too appreciate Todd (Brown’s) MVF (minimum viable funnel) ethos. Justin, please paint your point about the funnel being what makes traffic profitable on a teespring shirt and start selling it! There’s a real whole in the market for paid media podcasts I hope you do more content like that, Justin….